If you are an intermediate paddler with an interest in improving your own skills and learning how to help others become better paddlers, the Potomac Paddlesports' mentor program is for you. We'll pair you up with our top instructors who will show you methods, techniques, tips, and tricks for teaching and inspiring others. 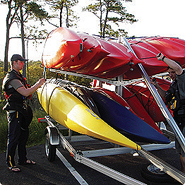 Interested in becoming a sea kayak instructor? Want to simply improve your ability to help other paddlers? Enroll in Potomac Paddlesport’s sea kayaking mentor program and assist our top instructors as they teach courses ranging from Fundamentals to Open Water. You’ll learn valuable teaching tricks and techniques, plus get hands-on experience as you work with students. Think of it as a step in between being a student and being an instructor. Highly recommended for anyone considering instructor certification. 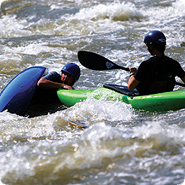 Interested in becoming a whitewater kayak instructor? Want to simply improve your ability to help other paddlers? Enroll in Potomac Paddlesports' mentor program and assist our top instructors as they teach a wide variety of beginner and intermediate courses. You’ll learn valuable teaching tricks and techniques, plus get hands-on experience as you work with students. Think of it as a step in between being a student and being an instructor. Highly recommended for anyone considering instructor certification. Below are some products that we frequently recommend to our rescue course students. Have a look, and if there's anything else you need to make sure you're ready for your sessions on the water, we have a great selection of gear in our online store! Check it out!